Glassjacks have an exciting range of coloured plastic glasses providing you with the opportunity to introduce a theme or style to your event or party. With a growing demand for stand out barware we offer a wide variety of coloured plastic glassware including white plastic drinking glasses, black plastic glasses, red plastic glassware, gold plastic drinking glasses, blue plastic glasses and silver plastic drinking glasses. 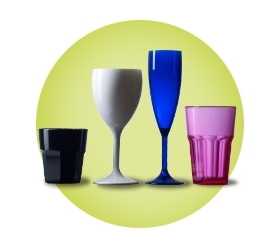 Plastic flutes, plastic wine glasses, plastic tumbler glasses, plastic shot glasses and plastic martini cocktail glasses are all featured in the assorted coloured glassware. Our coloured plastic glassware is from our Elite range of plastic glassware and has been manufactured from unbreakable polycarbonate plastic. It is made from food grade material. It is 100% reusable, 100% environmentally friendly and 100% recyclable at the end of it's life. These coloured plastic glasses are a practical solution for serving beverages at outdoor events such as weddings, festivals, concerts an d fetes. They really are a superb alternative to breakable glass. Bars, restaurants, pub gardens and all indoor venues would benefit from using these coloured plastic drinking glasses that make a colourful statement.